Maria, this is a stunning card. Love all the work you put into it. Very Beautiful!! Enjoy your day! This is pretty . I think we all have oldies ,but goodies stashed in boxes . Maybe we need to make a resolution for 2019 to use more of them ! You made your oldie just shine ! Great FUSSY CUTTING !! Gorgeous! I love the pink flower against the black background. a truly joy-ous creation! what a stunning black die cut to really show off the background and flower. Your Prisma and Gamsol coloring always blows me away! Really gorgeous use of this stamp, Maria. Love the white embossing and birds, and it pops beautifully on the black and white background. I need to start using some of my really old oldies. 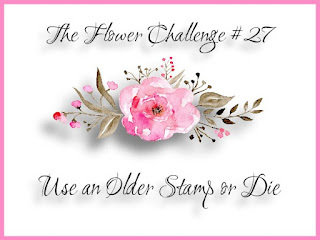 Certain stamps, like flowers, never lose their beauty! Your beautifully colored flower pops off the black and white background! Love the classy design with golden accents, Maria!!! such a beautiful elegant card Maria, I love your colouring of the flower and the layers used. Beautiful card Maria, I cant believe that stamp is 10 years old! Looks as fresh and relevant now as I’m sure it did then. Putting your lovely flower on the black die cut really makes it stand out, Maria, and the white embossed branches really add a great touch. Beautiful card Maria and I love the embossing in the background along with the intricate die cut. Such a gorgeous flower! Great job.